With a little bit of oomph you can help a sprinkle of seeds—lift flap—become a magical, three-dimensional bouquet of flowers. With a little bit of oomph, small notions—like a goldfish in a little bowl—open out to big oceans (just look through the peephole!). Oomph can transform a dog’s tail into a funny tale (there’s a miniature book involved). Oomph changes curiosity into discovery, daydreams into playthings, your singing into others’ dancing. A triumph of imagination, vibrant, colorful art, and paper engineering, A Little Bit of Oomph! is filled with pop-ups, lift-the-flaps, spinning circles and gatefolds—and, underlying every page, Barney’s timeless message that creativity is for everyone. Just add a little bit of oomph. 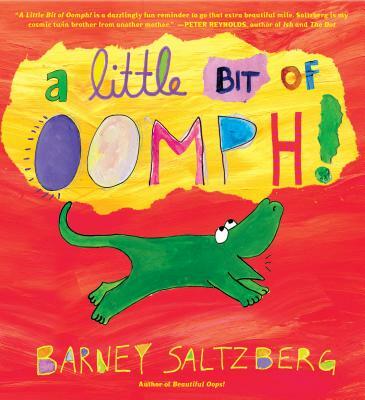 Barney Saltzberg is the author of more than 30 books for children, including Beautiful Oops!, My Book of Beautiful Oops!, Good Egg and the bestselling Touch and Feel Kisses series. Additionally, he’s recorded four albums of songs for children. He lives in Los Angeles with his wife, two dogs, and a pond full of fish.